Starbucks is unquestionably one of the most influential retailers on the planet; operating over 17,000 stores in 50 countries. It’s only natural that the retail world follows any new Starbucks initiative closely, especially if they offer new shopping experiences. So what can we learn from the new e-commerce site at http://www.starbucksstore.com that Starbucks launched this month? Overall, it’s a competent but not revolutionary e-commerce effort, with some strong features, some usability challenges, and a few very painful mistakes. Subscriptions – Create a recurring order for your favorite coffees and specify your preferred shipping schedule. You can also edit the shipping schedule for your existing subscriptions. The subscription feature is constantly implemented throughout the site, and feels like a core part of the experience (unlike other sites that offer recurring orders as an add-on). Graphic Design – A very credible design, with strong images, clear calls to action, and a visually uncluttered look. Navigation – It has all the traditional navigation elements right where you’d expect to find them (which is a good thing). Simple, straight forward guided navigation via a drop-down “super-menu”, ubiquitous on-site search, promotional spots, and a footer. Faceted Search – The guided navigation results can be further refined with helpful category specific filters. On-Site Search – A predictive type ahead feature shows you the # of results for popular searches similar to what you are typing. Rich Search Result Pages – Grid and List Views with Badges, Ratings, Prices, and Quantities are all scanable at a glance. A compare feature let’s you see the descriptive attributes for several SKU’s in a side by side view. Instant actions let the user take popular actions without ever drilling down to the product detail page. Heavy use of Hover-overs – Too many elements on the page automatically do something when the mouse hovers over them. The Mini-Cart, Subscription Widget, Product Images, and Search Results all leverage hover-over. I know these seem like cool features for advanced web-users, but I’ve seen these features test really poorly in usability studies. No mater how advanced the user is, it’s NEVER a good idea to have pop-ups appear over the top of the pages most important call to action (Add to Bag). Guest Checkout – The current flow is optimized for registered users and the guest checkout is de-emphasized. If a majority of visitors are going to check-out as guests (and I strongly suspect that is the case), then the flow should be optimized for Guest Checkout. Words like “Sign-In” and “Create an Account” are like nails on a chalkboard to users who just want to buy coffee without being aggressively marketed to. Guest users will still share almost all the info Starbucks wants, they will just do it in the context of placing the order. When the order is complete and the shopper is happy, Starbucks can still offer to create the account. 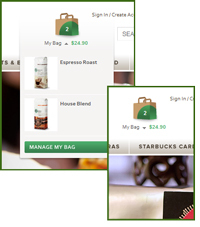 Mini-cart dependence – A mini-cart (or “My Bag” as Starbucks calls it) in the header can be a useful feature. It’s good to always tell the user how many products they have put in in the bag, and what the running sub-total is. However, Mini-Carts are usually a supplemental navigational aid, not a feature that the shopper is required to learn. On product detail pages, the only clue you get that you’ve added a product to your bag is an animation in the mini-cart. A typical user at a comfortable reading distance from the screen has an area of focus about the diameter of a quarter… if their attention is focused on the “Add To Bag” button, they might not notice the mini-cart animation at the edge of their peripheral vision. The result is often that the user clicks on the button multiple times before they figure out what’s going on, and ending up with too many of an item in their bag. Calls to Action on Product Detail Pages – “Add to Bag / Add to Subscription” buttons only live on top right corner of the Product Detail Pages. We call these buttons the Calls to Action (CTA’s) and they are by far the most important thing on the page… I like to call them the “Give Starbucks Money” buttons. Once the shopper scrolls down to read reviews, brewing tips, or other content they will no longer see any way to buy the product. At the very least, I’d like to see an extra set of the CTA’s on the bottom of the page, but it would also be interesting to test a floating set of buttons that stay persistently on-page. URL’s – The product detail URL’s are very long and have a number of dynamic variables at the end that are not user friendly (for sharing, bookmarking, etc…). The URL’s certainly aren’t SEO friendly. It would be better if static URL’s were used. The Shopping Cart URL is static but has “demand-ware” in the URL string (which is great SEO for Demand-Ware, but not so good for Starbucks). It’s common for shoppers to bookmark a shopping cart to come back to later… in this case the bookmark will be named “Cart – Shopping Cart” thanks to the generic Title Tag. 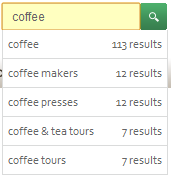 Bugs – There are still a few rough edges (on-site search says there will be 7 results for “Tea Tours” but it actually gives no results). If I stumbled across one piece of flawed data in the search index, then it’s not a big deal, but I have to wonder if there is systemic flaw in how content is indexed for the on-site search. No obvious checkout – Once the shopper has put their desired products in the bag, it’s too difficult to figure out how to check out. I’d highly recommend a “Proceed to Checkout” button every time something is added to the bag. At the very least, if the shopper expands the Mini Cart (aka “My Bag”), the call to action should be “Checkout” not “Manage My Bag”. Starbucks has deviated from typical conventions here, and I suspect they are going to pay for it with abandoned shopping carts. Shipping address – The “Same as Shipping” checkbox is implemented really poorly. It’s actually a “Copy Billing info to Shipping Info” button, if you change any of your billing info after checking the box, your changes will NOT be used for shipping (even though the box is checked). That behavior is going to create a lot of user confusion and cost Starbucks sales. In many cases, the shopper will never be able to figure out how to pass the required fields validation, due to this unorthodox behavior. Lack of cross-channel – How can a retailer with 17,000 stores, completely ignore them on their e-commerce site? Shoppers will use the product detail pages to learn about products, read reviews, etc… and then want to buy them in their local store. Yet, there are no features on starbucksstore.com to help with this common use-case. It is disappointing that Starbucks doesn’t offer a way to check store inventory, offer a “buy online pickup in-store” experience, or even tell the shopper which products are typically available in stores. A store-locator is one of the most frequently used tools on a cross-channel retailers e-commerce site (and it’s on the top navigation bar at Starbucks.com), but the store locator is hidden in the footer on starbucksstore.com. Alternative images – Products that have multiple images on the product detail page are simply broken. If a shopper clicks on one of the alternative images, they might expect it to replace the primary image, but instead they are going to be thrown to a new page with a full screen version of the image and no navigation whatsoever. If the user does know to use the back button on their browser, they will be permanently lost. Lack of a domain strategy – Starbucks has made great progress in merging all their various Starbuck Cards and Reward features into a single account and putting them all on the starbucks.com domain. So why are starbucksstore.com and mystarbucksidea.force.com on separate domains? Will users figure out that they need separate accounts on all three sites? By launching the e-commerce site on a separate domain, Starbucks is giving up one of it’s greatest competitive advantages. From an SEO perspective Starbucksstore.com has less domain authority than Peets.com, even though Starbucks get’s 30 times the traffic Peets does. It’s crazy that Starbucks doesn’t want to aggregate all their traffic and offer a seamless experience across all their properties. The world-wide-web is full of far worse e-commerce experiences than what Starbucks is offering, but I expected more from them. Retailers looking to add replenishment subscriptions will certainly want to look closely at Starbucks offering, but outside of that, retailers will have to look elsewhere for best practices. It’s pretty clear that the site was built as a stand alone project, and is not part of a comprehensive cross-channel strategy. About the Author: Jason “Retailgeek” Goldberg” is the foursquare major of his local Starbucks, and can give you directions and store hours for the Starbucks location at any airport in North America and most of Europe. When he’s not drinking iced latte’s he leads the Strategy and Customer Experience practice for CrossView, Inc, where he helps clients generate over $1B in e-commerce revenue. Thank you for the great write up of our new e-commerce offering. There is some very insightful feedback here and will be sure the team gets it and processes it very soon. Reach out directly as well anytime, always open to hearing others ideas on what we can be doing better!